How to be a BAWSE, according to IISuperwomanII herself. ICYMI, Manila's third YouTube FanFest was held on May 12, and some of your favorite YouTubers put on an amazing show. 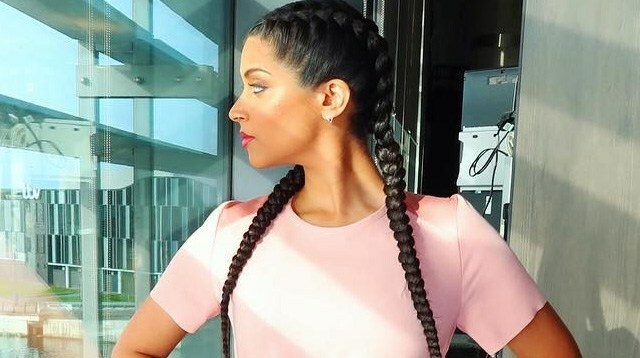 One name that stood out on the talent list is Lilly Singh, aka IISuperwomanII. One of the OG crowd, Lilly started her YouTube channel in 2010, and has quickly become one of the most popular content creators on the platform. As of writing this article, Lilly has over 11 million followers on her main channel and nearly 2 million on SuperwomanVlogs. Lilly isn't "just a YouTuber": she's also a skilled dancer and rapper, a published author, and she has released a red lipstick in conjunction with Smashbox called "BAWSE." Cosmo.ph spoke to Lilly about her YouTube journey, her passion projects (like #GirlLove), and her five-year plan. One aspect of YouTube fame she's most proud of? Her fans, who call themselves #TeamSuper. "I had a show in Dubai, and someone flew in from Armenia. A member of #TeamSuper paid for that fan to go to the show, and someone else paid for her hotel. Isn't that incredible? My fans are there for each other and really support each other. Some of them have even told me that all of their best friends are from #TeamSuper." What made you turn to YouTube to deal with your depression? Honestly, I think I was at a point in my life where I was getting pressure from so many places—"get a degree," "get a job," "get married"—and everyone was convincing me that my life had to be very structured. When I discovered YouTube it was a little reminder that you can still do things that are fun, that are creative. You don’t have to have such a structure and plan in life. So when I put my first YouTube video up, I really fell in love with the fact that I could say whatever I wanted and I had creative control. It was like a new ambitious goal to be successful at YouTube. Something that I wasn’t getting from school, or all the other pressures in my life. So that was really attractive to me. Coming from a relatively conservative culture/community, how did you address criticism you got when you first started? My parents are very liberal, but they still are Indian parents. So they still said things about cleaning my room or doing my schoolwork, certain traditional Indian things that they grew up with. That influenced my content because it influenced my parent characters—it never influenced my content to the point where my parents said "Don’t do this!" or "Don’t put this in your videos!" They never said that to me. They never even said I couldn’t make videos; they were very willing to let me try. But the culture influences my parent videos: obviously the parent characters and the accents, and the family scenarios, all of that. Criticism is always going to be there. As you get bigger [on YouTube] and grow in popularity, criticism grows as well. I think it’s important to remember that [criticism] is never going to go away. The only thing that has to change, and WILL change, is how you deal with it. On my journey to where I am [right now], I’ve always made it a point to be very spiritually and mentally strong, and know that when someone leaves a mean comment on my videos, they’re not telling my story—they’re telling theirs. To understand the psychology behind people who leave mean comments has been really helpful to me. What made you want to launch #GirlLove? Why do you think the concept of “girl drama” exists, but there isn’t a male equivalent? When I was in high school I remember girls not getting along, and just thinking that was very very normal. "Yeah, you have to go through high school and you have to have drama with girls, and that’s normal." As I grew up, I had to speak a lot at high schools and universities, and I saw that it hasn’t changed. Girls still feel like they have to compete with each other, still feel like they have to comment on what another girl is wearing, how she looks—you see that so much on TV and movies, like Mean Girls. Those kinds of movies are great and funny, but there’s always this message of 'girls don’t get along.' I think it’s our responsibility to teach young girls that it’s actually cool to empower other girls, because that’s actually how it is behind the scenes. On YouTube, with Lauren [LaurDIY] sitting right over there—I’m great friends with Lauren, I’m great friends with so many other female creators. As an audience member you might not think that, you might think we’re competing with each other. But it’s not like that! I think it’s important for kids to know that—that it’s important and COOL to support other women. There’s always going to be comparisons. When I started, I used to be compared so much to other creators. Now that I’ve grown in popularity, people compare other smaller channels to me. So I always tell people, "You can’t let that get to you." What were the steps you took to turn your YouTube channel into an actual business (complete with a production crew)? What’s your process like when it comes to turning mainstream concepts into your own? For example, if a specific tag is going viral, how do you make your videos unique? That’s a really good question. I think there is a lot of pressure to conform these days, to use clickbait, and use the enticing titles, and do the challenges, etc. I think a really big part of it is I have a 50/50 rule, which a lot of creators talk about. As an artist I want to try new things and experiment, but sometimes those aren’t received well. Sometimes you do something new, and even though I really like it my audience would say "what is this? This is garbage!" So 50% of my content is something my audience will like—parents react, types of people, those types of series where I know they’ll enjoy the content. But the other 50% of my time is spent doing new series, just so that as an artist I can also have fun. So that’s what I like, that balance. Who are your career inspirations? My biggest career inspirations are going to be of no surprise, because I mention them all the time. Dwayne ‘The Rock’ Johnson. I’ve had the honor of seeing him in a work environment as well, and aside from being his fan I’ve seen his team around him. I’ve seen how he speaks to his team, how he delegates to his team, and the trajectory of his career—how he went from wrestling [in WWE] to acting to having his own TV show to big movies—I think that’s very inspirational. He has proven that you don’t have to stick to your lane. I remember him telling me that when he left wrestling, everyone was telling him, “You’re a wrestler! You can’t do this stuff.” He was like, “No! I’m going to all these things.” As someone who is a digital creator, who wants to do music, who wants to get into acting, that’s really inspirational to me. To know that you CAN create your own path, just as he’s done. Selena Gomez. She’s also a big inspiration to me. One of the things that’s really difficult for creators is…like I said, I’ve been making videos for seven years, and I’m a different person than I was seven years ago. Seven years ago I hadn’t experienced a lot of the things I experienced now, I was talking about school a lot more, or talking about my first relationship a whole lot more. I’m older now, I don’t go to school anymore, I don’t make videos like that anymore. Something I learned from Selena is she started in Disney but has grown up to be this really strong woman. I’ve been watching her transition and how she’s done that is a really great guideline for me. I want to make sure that I grow up with my art as well, and already done that. You’ve been on The Tonight Show Starring Jimmy Fallon twice, met The Rock and helped him create his first YouTube video, received a Diamond Play Button [awarded to YouTube channels that surpass 10 million subscribers]…what is your next goal? What do you see yourself doing in five years? I hope in five years I’m still doing this, because I really like it and I don’t want to ever stop working in the digital space. I think it’s the future, I think it’s great. I do hope that I’m in a place—I mentioned it already, I’m building up a team, I’m delegating—I want to get to a place where five years from now I oversee the business, but I also spend a lot of time being creative. When you’re building your business, things do take up your time: "Oh, I need to learn this new algorithm on YouTube," "I need to hire and train these people," etc. I can’t wait to get to a place where I can have such a strong brand culture, where everyone on my team knows their job and work well together, where I can be super creative and my team can execute, but I can oversee the business as well. I just want to be like Dwayne [Johnson], Dwayne is at that point in his life right now. How is How To Be A Bawse different from other memoirs? First of all, I didn’t want to write a book. When I was first approached by publishers, I said I didn’t want to write a book just for the sake of writing one. "I want to write a book because I have something to say," is what I told them. When I reached a point in my career where I accomplished a lot of things on my bucket list, where I was really happy with my personal life, I thought, "I’ve had some really unique experiences that are super out-of-this-world and extraordinary, and I feel like there are lessons that I want to extract and share with people." That’s when I decided to write my book. It’s not a memoir, it’s a guidebook. It’s different from other YouTube books because I’m not just telling my story. I mean, people know my story, they’ve watched my videos. Whether you know me or don’t know me, it’s a guidebook with practical tips on how to just be the better version of yourself. Cosmopolitan Philippines turned 20 years old this month. Do you have anything to say to girls who are just entering their 20s? Of course! It goes along with what I said earlier. When I was graduating university, I was convinced that there was this line I had to follow in life. I think even after you’re done graduating, and for the rest of your life, you should keep trying new things. I wish I was encouraged more to experiment because you will never be able to figure everything out. When I was younger, YouTube didn’t exist. Little Lilly would have never been able to say, "You’re going to be on YouTube." So just keep trying, keep experimenting—you’re never too old to learn new things.